People with rosacea often experience negative impacts on self-esteem and confidence, which can result in anxiety, depression, and social isolation. 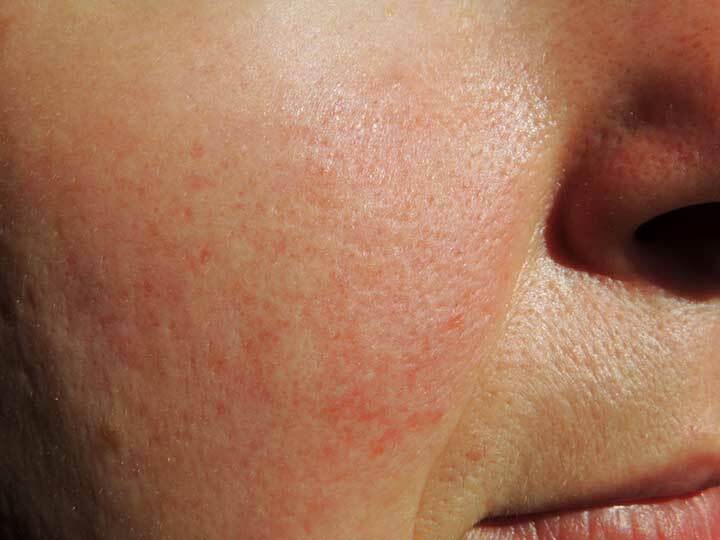 Rosacea is a very common skin disorder that occurs mainly in adults. Symptoms include redness, bumps, scales, visible blood vessels, and pustules on the face. It can be accompanied by stinging and burning sensations on the affected skin as well as watery and irritated eyes. This skin disorder is characterized by chronic inflammation, abnormal immune response, and a compromised barrier in the epidermal layer of the skin. [1,2,3] To help better manage your symptoms, your rosacea natural treatment plan will need to take into account a variety of factors. The skin of people with rosacea is particularly sensitive. Keeping your skin moisturized can help to reduce stinging, burning, and the feeling of tightness. Use gentle cleansers and moisturizers that are appropriate for sensitive skin, and try out different types to find one that doesn’t make your symptoms worse. Be sure to wear gentle sunscreen regularly to protect your skin from sun damage. There are many well-known triggers for rosacea. These include stress, sun exposure, warm temperatures, alcohol, and spicy foods. These affect rosacea in a variety of ways. Stress, for example, contributes to skin inflammation through a complex relationship between the skin and the endocrine, nervous, and immune systems. 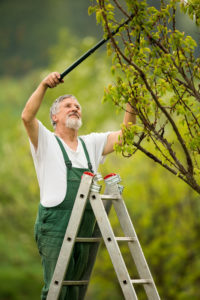 Ultraviolet (UV) light exposure on the skin produces reactive oxygen species, which contribute to inflammation as well; protecting your skin from the sun can help keep symptoms under control. [1,5] Keep a diary to identify your own unique triggers. Bacterial imbalance in the gut may be playing a role in your rosacea. For example, an infection with bacteria called Helicobacter pylori has been associated with rosacea and getting rid of this infection may help treatment. Dietary changes, such as eating more broccoli and garlic, may help kill H. pylori. Read more about H. pylori in 4 Causes of Gastritis That You Can Treat Yourself. Small intestinal bacterial overgrowth (SIBO) is also associated with rosacea. SIBO is characterized by an abnormal level of bacteria in the small intestines. In a recent study, people with rosacea had a significantly higher prevalence of SIBO than controls, and eradicating SIBO (using antibiotics) helped to get rid of rosacea symptoms, as well. In 78 percent of patients, skin lesions fully cleared after the therapy. Those people who received placebo initially, but who later switched to the SIBO elimination treatment, showed rapid and dramatic improvements in their symptoms. 96 percent of people reported sustained remission at a nine-month follow up. Although antibiotics may be the first line treatment for eliminating SIBO, herbal treatments can be as effective, if not more effective, in treating this condition. Learn more about SIBO in SIBO Treatment with Herbs Is as Effective as Antibiotics; Combine with a SIBO Diet for Even Better Results. You may want to try some of the various rosacea natural treatment options that include herbs, supplements, and topical creams. A very effective option is nicotinamide (also known as niacinamide), a B vitamin that is a natural antioxidant and anti-inflammatory that helps a variety of inflammatory skin conditions, including rosacea. It also helps to stabilize the epidermal barrier in the skin. [5,8,9] It can be taken orally, or used in a topical cream. Talk to your doctor about proper dosage. Before trying any new topical therapies, test the product on a small area of skin first, instead of the entire face. People with rosacea have very sensitive skin, and even minor exposure to something new can exacerbate symptoms. People with rosacea often experience negative impacts on self-esteem and confidence, which can result in anxiety, depression, and social isolation. People report avoiding meetings at work or going out in public and other social phobias because of embarrassment and anxiety over their symptoms. One study found that people with rosacea were significantly more likely to feel stress and social phobia than controls. The researchers determined that fear of blushing and appearing bright red provided a significant source of anxiety for these people, and suggested that treatments that target the fear of blushing could help. Further study on three subjects found that cognitive behavioral therapy helped to reduce stress, which benefited symptoms and the negative psychological reactions to them. Find a therapy that works for you, such as hypnotherapy, cognitive-behavioral therapy, meditation, or counseling to lower any stress or anxiety you feel over your rosacea symptoms. This will benefit not only the condition itself (as stress can be a major trigger), but also your emotional well being as well. Do you have rosacea? Do you know of any tried and true rosacea natural treatment options? Share your tips in the comments section below. F1000Prime Rep. 2014 Jul 8;6:50. Clin Psychol Psychother. 2012 Nov-Dec;19(6):488-95. G Ital Dermatol Venereol. 2010 Apr;145(2):213-9. Semin Cutan Med Surg. 2011 Sep;30(3):148-55. Am J Clin Dermatol. 2010;11(5):299-303. Clin Gastroenterol Hepatol. 2008 Jul;6(7):759-64. Australas J Dermatol. 2014 Aug;55(3):169-75. J Eur Acad Dermatol Venereol. 2005 Sep;19(5):564-8.
alcohol, aloe vera, anti inflammatory, antibiotics, antioxidant, anxiety, anxiety depression, bacteria, causes of gastritis, chronic inflammation, cognitive behavioral therapy, depression, diet, feverfew, foods that prevent wrinkles, garlic, gastritis, green tea, gut health, h pylori, health, helicobacter pylori, herbal treatments, infection, inflammation, kill h pylori, licorice extract, meditation, milk, milk thistle, msm, natural treatment, niacinamide, reactive oxygen species, report, rosacea, rosacea natural treatment, sibo, sibo diet, sibo treatment, skin, social phobia, stress, supplements, treatment with herbs, vitamin, vitamins. I am now 75 I had Rosacea turn up when I was 40. Lucky enough to meet a Shackley Vitamin Agent who suggested Vitamin B complex. The Dr. had prescribed ‘Betnovate’.! A beautician was appalled. The condition was under control very quickly with Vitamin B Complex. Never suffered from it since. I am glad to hear that a natural remedy helped you to completely get rid of your rosacea! What a simple and effective fix.